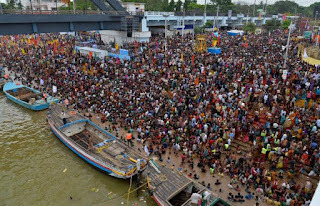 The President of India Shri Pranab Mukherjee has condoled the loss of lives in a stampede at the Pushkarulu Ghat of Godavari River in Rajahmundry District of Andhra Pradesh. In his message to Shri E.S.L. 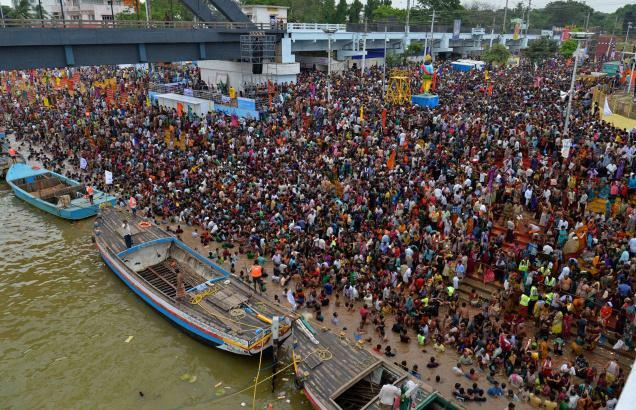 Narasimhan, the Governor of Andhra Pradesh, the President has said “I am saddened to learn about the stampede at the Pushkarulu Ghat of Godavari River in Rajahmundry District of Andhra Pradesh, where a number of devotees have lost their lives and many others are injured. I understand relief and rescue operations are currently underway. I call upon the State Government and other authorities to provide all possible aid to the bereaved families, who have lost their near and dear ones as well as medical assistance to the injured. Mr. Hideaki Ohmura, Governor of Aichi Prefecture of Japan called on Prime Minister Shri Narendra Modi today. Shri Narendra Modi fondly recalled his meetings with Mr. Ohmura in 2012 and 2014, and appreciated the close business ties between Aichi-based Japanese companies and India. Governor Ohmura briefed Prime Minister Modi about his efforts to promote greater trade and investment relations between Japan and India. The Prime Minister welcomed the initiatives taken by Japanese SMEs in this regard, and promised all possible support through the “Japan Plus” mechanism to their endeavours. The Prime Minister also called for closer interactions between Indian states and Japanese prefectures to promote business to business ties. The Prime Minister, Shri Narendra Modi has conveyed his good wishes to all pilgrims on the start of the Kumbh Mela in Nashik. "My good wishes to all pilgrims on the start of the Kumbh Mela in Nashik. Have a wonderful pilgrimage, filled with joy and spirituality", the Prime Minister said. Wheat procurement by government agencies during current Rabi marketing season has crossed the last year mark. As on July 13, 2015, total 280.87 lakh MT wheat has been procured in various wheat growing states, while during last season, on the day, it was 2 71.66 lakh MT on the day. Infact procurement so far has crossed the total procurement of last Rabi reason, which was 280.23 lakh MT. The meeting of Parliamentary Consultative Committee was held at Panaji, Goa yesterday under the Chairmanship of the Union Home Minister Shri Rajnath Singh. During the meeting, the Union Home Minister applauded the efforts put in by Indian Coast Guard in coordinating various activities related to strengthening of Coastal Security mechanism. The committee members accompanied by Inspector General, VSR Murthy, Deputy Director General (Operations & Coastal Security), Coast Guard Headquarters also visited the Coast Guard District Headquarters No. 11, Goa for an overview of the Remote Operating Station (ROS), Goa. The ROS, Goa is part of the Coast Guard project of Coastal Surveillance Network (CSN). The Phase-I has 46 Radar Stations (36 on the mainland and 06 on the Lakshadweep Islands, 04 in A&N Islands) and the Phase-II of the project shall include additional 38 Radar Stations. With the completion of these Radar Stations, the Indian coastline shall have near gap free electronic surveillance of the entire coastline. The delegation, thereafter, visited the Indian Coast Guard Ship Samudra Prahari, the state-of-the-art Pollution Control Specialised Vessel, for firsthand knowledge of Coast Guard operations.